Built in the 16th Century The Barley Mow has retained all of its original features combined with modern conveniences which together make the perfect setting for a traditional community pub. Situated at the entrance to Hersham Village, The Barley Mow caters for all. We have live music every Friday and Saturday evening, darts team and in house competitions which welcome all to join with the chance to win great prizes. 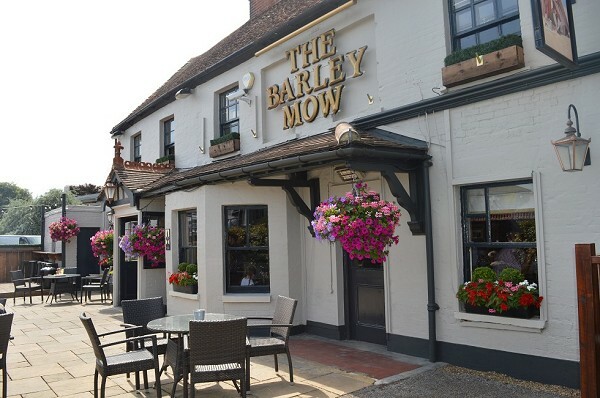 At The Barley Mow the restaurant area has a relaxed atmosphere with an extensive menu to suit all. The Sunday Roast is not to be missed and booking is recommended. We use fresh local produce in our ingredients for a better taste making all our meals mouthwateringly good. Our dining area is separate from the main bar too. Our large garden comprises of lots of seating with umbrella's as well as an enclosed heated area for the colder months. In the summer, we have the perfect space in our garden for a spot of sunbathing, whilst sipping on that well deserved cold pint of beer, refreshing glass of wine or the perfect G & T.
For the kid's we have a fantastic playground to keep them entertained. In the cold winter months you'll enjoy the flickering glow and crackle of the real log fire, made all the better with great company. Although we are not a sports bar or anything like that, we do have plasma screens and will show selected games on Sky Sports.